Home Food Which Should I Buy First — a Juicer or Blender? A juicer or blender – which should I get first? This is the most common question I am asked wherever I go. Since top-quality masticating juicers and high-speed blenders are expensive, everyone starting a raw food lifestyle is trying to decide whether to invest in a juicer first or a blender. So here is what you need to know to make an informed decision. Remember, when I talk about fruit and vegetables, or any foods, I am talking about USA-grown organic produce! 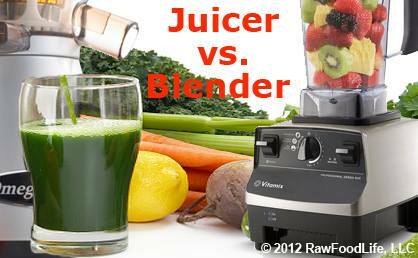 Comparing a blenders or juicer is like comparing jogging with yoga. They’re both very healthy, yet they’re as different as can be. To get the best health benefit you may want to use both. The first rule of thumb for everyone on a raw food diet is that you MUST get high, quality, dense, easily absorbable nutrition, whether from juicers or blenders! These days, with our soils so depleted and seeds stock often weaker, its almost impossible to get adequate nutrition just from raw fruits, nuts and vegetables, even when organic. But with the addition of some fresh raw juices and smoothies it becomes easy! 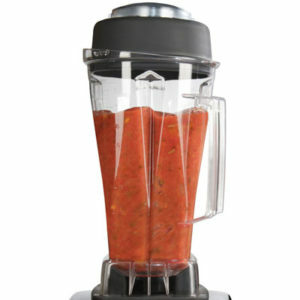 Either a juicer or blender will give you a huge shot of dense nutrition that your body will absorb like a sponge. There are some important differences, but the main thing is that it isn’t a contest – both make a valuable contribution to a raw food lifestyle, though in different ways. 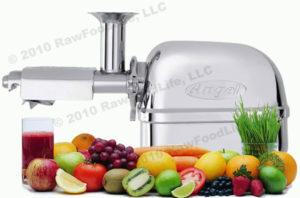 Juicing, in a slow speed masticating juicer, is designed to extract as much densely packed nutrition from vegetables as possible by removing all the fiber (pulp). This makes it faster and easier for your body to assimilate all this nutrition without activating your digestive system. When you have fiber in a meal, or even a smoothie, it can take hours to digest and absorb. But with fresh raw juices your body can do the same job in minutes! Of course, there is nothing wrong with fiber – it is an essential part of a raw food diet. You have to eat food! Juicing is only one tool you need in a raw food lifestyle to assure yourself of getting the high nutritional density a raw food diet needs to be successful. But it isn’t a replacement for eating real food. In addition, juicing is ideal for cleansing and detoxification as well as for people with very sensitive digestive systems that may be sensitive to a high fiber raw food diet when the first start. The benefits of zero fiber means juicing is easy on your digestive system, so is often used for juice “feasts” or fasts as a method to gently cleanse and detox the body while giving the digestive system a rest. Smoothies and drinks made with blenders don’t do that. 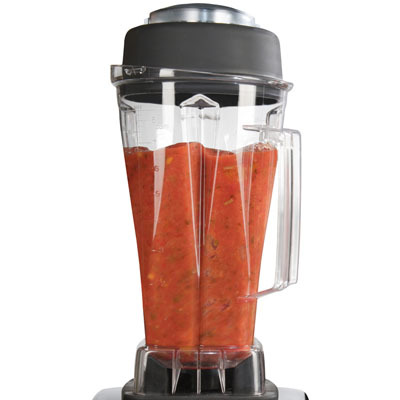 A high powered blender like the Vitamix or Blendtec cracks open the cellular wall of your fruits or veggies, releasing all the nutrients and making them easier to assimilate – but it is much more like eating a meal since you still have all the fiber and other ingredients in the smoothie. You get better assimilation, but not the concentrated nutritional density of juice because you couldn’t ever get as much food into a Blendtec or Vitamix as you get when you make just one glass of juice. You could never eat this much food all at once if you had to thoroughly chew it. Blending it would include a lot but still no where near as much. I use my Blendtec blender regularly to make smoothies almost every morning for my breakfast. This is part of my Fast, Easy 75% Raw Food Strategy. The way that works is based on the fact that (with snacks counting as one meal) we normally eat 4 meals a day. So if you have 2 raw meals plus raw snacks you are automatically a 75% raw foodist! To make that easy I usually have a smoothie every morning, a big salad for lunch or dinner, all raw food snacks and then anything I want for dinner (within reason of course). I use my juicer to occasionally replace meals when I want to lose a little weight, for a quick pick me up or during a fast – even just a one-day fast. Finally, sometimes you want a smoothie with all the fiber to help “chimney sweep” the colon. Juice has no fiber so doesn’t cleanse the colon at all. So both are good, but if I had to start with one I would start with a Blendtec or Vitamix because it is much easier to start a raw food program with smoothies than juices. It is important to remember that even fresh, raw juices are highly concentrated, processed foods – only you did the processing yourself. So when you make fresh juice you are concentrating whatever is in the fruits or vegetables, from the vitamins and minerals (good) to the sugar (bad)! Of course, we all know that fruits are loaded with of sugar (fructose) but even fresh raw vegetable juice can be high in sugar (mostly glucose) – especially non-greens like carrots or beets. The reason you have to be careful about making juices too sweet is that they can elevate your blood sugar, which is a problem for anyone with blood-glucose issues like diabetes or hypoglycemia or damage your liver (fructose). Even if you haven’t been diagnosed with hypoglycemia or diabetes you could have subtle symptoms that aren’t yet diagnosable from decades of eating processed foods that always have added sugar in them! If you have known blood sugar issues please talk with your medical professional before you start juicing. It is easy to forget that both smoothies and juices are processed FOODS and quickly chug them down like water. But you must always remember when enjoying your juicers or blenders to “drink your solids and chew your liquids” — because digestion begins in the mouth. It is best to chew your smoothies and juices to thoroughly mix them with the digestive enzymes in your stomach. Neglecting this can cause imperfect absorption, or even gas and bloating. 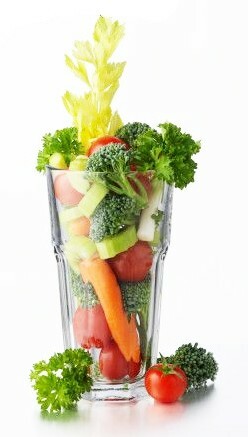 The fiber in smoothies, especially green smoothies, has a cleansing effect on the colon. Smoothies are more filling than juices and more satisfying for regular, long-term use. Sugar is absorbed slower because of the fiber. Smoothies let you to enjoy fruit without the inevitable sugar spike you could get from some juices. The fruit in a smoothies will be like eating whole fruits. NOTE: For most people I recommend avoiding fruit entirely when starting a raw food diet because we all suffer from improper sugar digestion to some degree after decades of eating processed foods. Store-bought smoothies are designed more for their profit than your health. These smoothies are usually made with the cheapest, most commercial ingredients like frozen fruit, sugary juices and liquors for taste. It is rare to find a juice bar that will pay a few cents extra to buy organic ingredients, so if they didn’t thoroughly wash everything then you could be getting pesticide and chemical residues in your smoothies, too – far from the health-builder you were looking for! Blenders are easy to clean. Most of the time I clean my blender just by running it under hot tap water. I sometimes add a bit of water and dish soap to the blender and push the Pulse button for a few seconds. 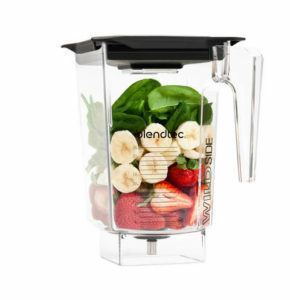 Because blenders are so much easier to use and clean they are often the first choice of investments when starting a raw food diet. Remember, the easier it is the more you are likely to actually do it. When you start with a blender you give yourself the best shot at acclimating yourself to a raw food lifestyle successfully. Smoothies are a great tasting treat for the whole family – especially kids. Smoothies are great for making fruit-based drinks because it contains the whole fruit and avoids a lot of the sugar rush kids get from processed, sugary drinks. You can easily mix and match flavors to please the taste buds of anyone in your family, from a favorite fruit to a dash of raw, unsweetened cacao powder. You can make a lot more than just smoothies with a modern, high-power blender. It’s easy to make everything from warmed-up soups (under 118°F to be still raw) and sauces top salsas, salad dressings and dips. You can also add food-based supplements and super foods to your smoothies. A spoonful of hemp protein powder or spirulina adds a ton of dense nutrition to your smoothies. You probably wouldn’t add supplements to a glass of fresh juice, however. 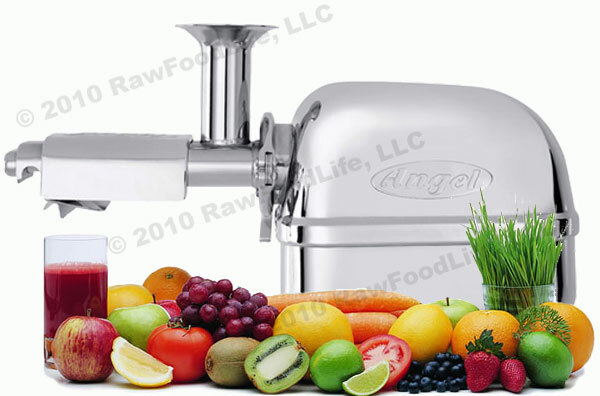 Though I usually recommend blenders for starting out on raw food because it is easier and more convenient, virtually all long-term, serious raw foodists use juicers as well. As your diet becomes more and more raw-food based, you will need more and more sources of densely packed nutrition because your body will start to assimilate more nutrition from a smaller volume of food. To support this you need to periodically enjoy fresh raw juices both just for fun as well as for the occasional cleanse or detox. Fresh juices are the fastest shortcut to dense, easily absorbed nutrition. Fresh, raw juice gives you all the nutrients without requiring work by the digestive system, ideal for cleanses or detox as well as for people who have digestion problems and who need to heal themselves before they can properly absorb nutrients from raw foods. Though the fiber in smoothies helps “sweep” the colon, juice is also a great way to cleanse other systems in your body while giving the digestive system a rest. Juice is ideal for cleansing, detoxifying and healing. I have seen numerous people heal all kinds of chronic health problems by following a supervised juice fast or juice feast. The idea is to drink only fresh, organic raw juice for a period of time, allowing your digestive system to take a break while your excretory system can work on deeper detoxifying. When your body is eating cooked food you are consuming toxins faster than you can eliminate them so they build up in your tissues, eventually causing health problems and disease. But if you stop consuming new toxins and let your digestive system rest, your excretory or elimination systems no longer have to deal with incoming toxins and start working on eliminating older, built-up toxins in your tissues. In general, juice vegetables but eat your fruits whole or avoid them altogether. Fruits need all their original fiber in order to slow down the absorption of sugar in your blood. Most vegetables contain less sugar and therefore don’t need as much fiber to slow down absorption (with the exception of carrots and beets). Juicing gives you a quick burst of energy since it takes so little time for your body to absorb the dense nutrition in juice. 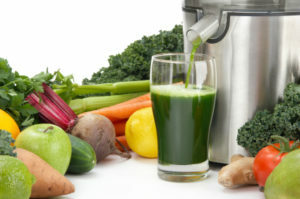 Whenever you are juicing for more than a day it is a good idea to help your system detoxify all the toxins your excretory system will be flushing from your body. For that, always drink plenty of pure water. Also, since there is little or nothing passing through a major excretory organ – the colon – you should help flush the toxins that are usually removed by the colon using enemas or colonics. Cleaning a juicer is a bit more work than cleaning a blender. Personally, I don’t think the time difference is significant – a matter of minutes. Juices are less satisfying or filling than smoothies. After a smoothie you may feel like you just had a meal. After a juice, since there is no fiber, you may not always feel as satisfied. However, that feeling of satisfaction is a bit of “programming” based on old habits – not on what your body actually needs nutritionally. I have found that I quickly get used to juicing even during a juice fast. When fasting I always drink plenty of water, which helps make me feel more satisfied (of course, I drink high pH alkaline mineral water from my water ionizer). I also carry a thermos filled with fresh juice that I can sip on throughout the day during fasts just in case I do getting a little overwhelmed by hunger. A juicer lets you juice almost anything. You might never put beets, carrots or ginger into your smoothies, but you can juice them easily. Dark leafy greens like kale and spinach are easier to juice and more alkaline-forming. In a green smoothie you can only add one or two large leaves of kale without affecting the taste while dramatically adding to the alkalinity.